A per­cep­tive arti­cle on the growth and evo­lu­tion of the PLAAF. In the ear­ly years, PLAAF was con­cep­tu­alised as ancil­lary and long range artillery of the army; PLAAF was quick to embrace RMA after the Gulf war and by the turn of the cen­tu­ry start­ed con­sol­i­dat­ing on var­i­ous aspects like infor­ma­tised and asym­met­ric war­fare tech­niques and enhance its strate­gic pow­er pro­jec­tion capa­bil­i­ty in an effort to build itself into a strate­gic air force by 2020. China’s use of air­pow­er in the 21st cen­tu­ry is also guid­ed by the phi­los­o­phy of coer­cion aimed at com­pelling to change the behav­iour of the tar­get State. The total num­ber of fight­er and bomber air­craft with PLAAF in 2000 con­sist­ed of 1900 J-6; 720 J-7; 222 J-8; 55 Su 27/J-11; 440 Q-5 (mod­i­fied MiG 19); 305 H-5/IL-28; 142 H-6/Tu-16 and just about a dozen JH-71 . Its front line bomber fleet con­sists of no more than a hun­dred H-6 air­craft with a weapon car­ry­ing pay­load capac­i­ty lim­it­ed to 20,000 pounds; the peri­od did see a change in PLAAF’s pro­file from an ear­li­er force which con­sist­ed of basic fight­ers with lim­it­ed radius of action, low end avion­ics and lim­it­ed fire pow­er capa­bil­i­ties to a force equipped with AWACS, air to air refu­elling and mul­ti-role tac­ti­cal air­craft with high end avion­ics, fire­pow­er and extend­ed radius of action to reach at least the first island chain, Sprat­ly and Para­cel. It’s been a haughty jour­ney for the Chi­nese air force since its cre­ation from a small army unit based in Wuhan in the mid­dle of the twen­ti­eth cen­tu­ry. In the ear­ly years, PLAAF was con­cep­tu­alised as ancil­lary and long range artillery of the army; which con­tin­ued to be the guid­ing phi­los­o­phy for more than three decades until the com­mand was hand­ed over to a hard-core air force pro­fes­sion­al — Wang Hai. 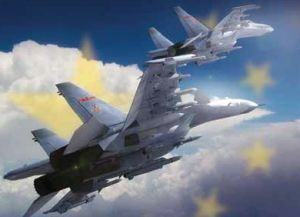 Chi­na dur­ing the course of PLAAF’s evo­lu­tion has had a num­ber of vision­ar­ies who believed that air pow­er should be cen­tral to the mil­i­tary strat­e­gy and there­fore under­lined the impor­tance of it being effec­tive­ly employed in the cal­cu­lus of war-fight­ing doc­trine. In fact Mao as ear­ly as in 1949 had men­tioned that oth­er than hav­ing a pow­er­ful army; it was also imper­a­tive for Chi­na to build a pow­er­ful air force and a navy. Hence it was not only the mil­i­tary but also the polit­i­cal lead­er­ship which had a vision for the air force, though, in its periph­ery, but at the same time acknowl­edg­ing the impor­tance of employ­a­bil­i­ty and the effi­ca­cy of air pow­er in future bat­tle space. How­ev­er, China’s secu­ri­ty dilem­ma and PLAAF’s evo­lu­tion basi­cal­ly stems from its polit­i­cal lead­er­ship guid­ed by Mao, Zhou, Deng and Jiang. Mao’s mil­i­tary phi­los­o­phy was deep-root­ed in ‘People’s War’; and also reflect­ed in the large num­bers of anti­quat­ed and lag­gard air­craft in the air force dur­ing that peri­od. Both Mao and Zhou were offen­sive real­ists; though Zhou much less­er of the two; and China’s secu­ri­ty strat­e­gy large­ly expound­ed an intol­er­ant approach; observed the world as a hos­tile place and con­sid­ered that its entire secu­ri­ty dilem­ma was a result of the oth­er coun­tries impe­ri­al­is­tic poli­cies. How­ev­er Deng and Jiang more sober; inte­gra­tionist and believed in the prin­ci­ple of engage­ment and coop­er­a­tion; which was also the hall­mark of defen­sive real­ism and a pil­lar of China’s secu­ri­ty strat­a­gem in the Deng-era. Hence, post-Mao, there was an appar­ent trans­for­ma­tion of the State’s pol­i­cy from ‘offen­sive to defen­sive real­ism’ and Chi­na as a result was push­ing hard to pur­sue a strat­e­gy of main­tain­ing ami­ca­ble rela­tion­ship with its neigh­bours. The trans­mu­ta­tion of the evo­lu­tion­ary shift in the post-Mao era was fol­lowed by prop­a­ga­tion of Four Mod­erni­sa­tions; favour­ing mod­erni­sa­tion of all sec­tors in the econ­o­my. The con­cept had been prop­a­gat­ed by Zhou in Jan­u­ary of 1975 while speak­ing before the fourth Nation­al People’s Con­gress and Deng car­ried it for­ward by lay­ing empha­sis on mod­erni­sa­tion of agri­cul­ture fol­lowed by indus­try, sci­ence and tech­nol­o­gy and then nation­al defence. The Four Mod­erni­sa­tions did not how­ev­er cat­a­logue mil­i­tary or nation­al defence as its last pil­lar; but only stat­ed an idea that nation­al defence must be built on a country’s eco­nom­ic strength and there­fore, it was first essen­tial to strength­en the fun­da­men­tals before ini­ti­at­ing the process of its mil­i­tary mod­erni­sa­tion. 1 Frank W Moore, “China’s Mil­i­tary Capa­bil­i­ties”, Pub­lished for Insti­tute for Defence and Dis­ar­ma­ment Stud­ies, Cam­bridge MA, June 2000.